The end is most definitely nigh . . .
Riley Blackthorne has always known that fellow Demon Trapper Denver Beck had a chequered history, but she's not prepared for what it means to be in love with a guy with this many dark secrets. Now that he's finally admitted to himself that he's in love with her too, there's no more hiding the truth about his past. And as it turns out, fending off a demon apocalypse is nothing compared with what's to come . . . It is always hard to say goodbye to a series, particularly if it's one of your favourites. I have been crazy about Jana Oliver's Demon Trappers series ever since I read the first book and with each instalment I have come to love the characters and the world she has created more and more. So I was both excited and terrified to pick up the last book Foretold. Excited to spend more time with Riley and my favourite YA hottie Beck but terrified that I wouldn't like the way things ended and that the book wouldn't live up to my crazy high expectations. Well I'm happy to say that Jana Oliver has done her Demon Trappers proud and this was the best book in the series. I don't want to say too much about what happens because I would hate to give spoilers but you should prepare yourself for an action packed thrill ride. Learn Beck's secrets, find out if he and Riley will ever be able to put the past behind them and build a future together, watch the ultimate battle between heaven and hell and find out what the future has in store for Atlanta. I loved the way all of our favourite characters have their part to play. Not just Riley and Beck but also Peter, Simon, Masters Stewart and Harper, even Ori and Justine have important roles that may surprise you. As usual nothing is quite what it seems and you will be shocked by some of the events that take place. Friends may become enemies but can previous enemies ever become friends or allies? 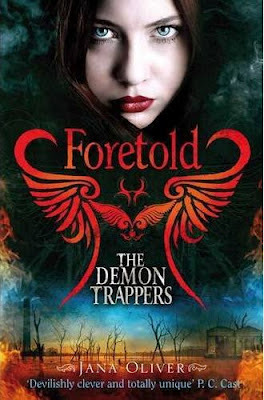 Fans of the series will love Foretold but if you're new to the series then I would highly recommend starting with the first book Forsaken (released as The Demon Trapper's Daughter in the US). This is one of my favourite YA series and I only wish there were another 10 books to come. Having said that I would rather see things end on a high note and leaving me wanting more than have the story dragged out until I'm bored with it. Jana has mastered the art of leaving her readers satisfied but wishing for more and I know whatever book she writes next will be at the top of my wish list! It was a fab end to the series so I hope you love it as much as I did when you get your copy!